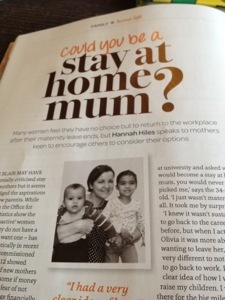 I just realised I forgot to mention that my feature “Could you be a stay at home mum?” was published in the February/March edition of the Green Parent magazine. Hopefully some readers will have found it useful as they think about what’s right for their family. UPDATE March 2016: You can now read this feature on The Green Parent’s website, as it was chosen as one of the top 20 stories from their first 70 editions.